Much of the genesis of the Beatles is a bit nebulous and is often argued, but most Beatles historians cite the date, July 6, 1957, as the official beginning of the Beatles. John Lennon, a neighborhood guitar-player (local trouble-maker, part-time shoplifter and full-time egomaniac) had been playing around at a few local gigs in the area for a year or so. John’s initial band was called “The Blackjacks”, consisting of a few of his mates from school. Soon thereafter, the band’s name was changed to “The Quarrymen”, in honor of their present school, Quarry Bank High School. It was on July 6, 1957 that John and his ragtag band were playing twice at the St. Peter’s Church fête in the Woolton Parish. The Quarrymen, led by John, played on the back of a coal truck, giving one performance in the morning and another in the early evening. Several cameras were snapping shots of the fête, and the very brash Lennon took the lead vocals on a few of the popular rock ‘n roll songs of the day. Paul had been invited to watch the Quarrymen by a mutual friend. After the band’s first concert, Paul was introduced to John, who, Paul recalled, had breath smelling of illegally-obtained beer. The man who introduced the two budding musicians was Paul’s pal, Ivan Vaughn, who coincidentally enough was born on the exact same day as Paul (June 18, 1942.) After the brief introduction, Paul played John the song “Twenty Flight Rock” by Eddie Cochrane. The two were very impressed with one another. As John recalled, “I dug him.” So much so that John asked Paul to join his fledgling band the next day. John stated that he made the momentous decision somewhat begrudgingly. “I was the kingpin”, John said- far more talented than his fellow bandmates. But he knew how talented Paul was from the initial meeting. Thus, with Paul’s obvious talent and personality, his agreed-upon and unquestioned position as the group’s “leader” would be in jeopardy, or at least, lessened to a degree. “I had to decide whether to make myself stronger or make the group stronger”, John recalled. Fortunately for the sake of music fans the world over, John decided to “make the group stronger” and asked Paul to join. Although Paul was invited and he accepted sometime in July of 1957, he did not join the Quarrymen right away. Paul and his kid brother Michael were scheduled to go away on a summer boy scout jamboree in the following weeks. It was at this jamboree that the young Paul made his public singing debut, getting up and singing in front of his fellow scouts and scout masters, along with his brother Mike. On October 18, 1957, Paul McCartney made his non-boyscout public singing debut with John Lennon and their now-mutual band, The Quarrymen. The historic occasion took place at a local dance joint called “The Conservative Club”. Paul was extremely nervous and during his first-ever solo number, his voice kept cracking, much to the gleeful delight of John, who kept breaking up every time Paul’s voice cracked. Ridicule aside, John and Paul were soon to become nearly inseparable “best mates”. The two would often play hooky from school together, sneaking into Paul’s deserted house and playing records, chatting and filling Paul’s dad’s pipe with tea leaves and “having a smoke”. Paul showed John the first song he ever composed: “I Lost My Little Girl”. This spurred John into composing too, and he came up with his first composition, the similarly titled “Hello Little Girl”. Soon the two boys started composing songs together. 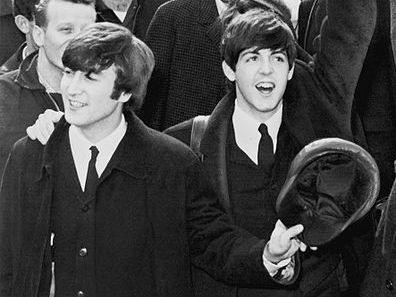 Although both John and Paul continued to compose songs on their own too, they never broke their pact and every song, whether solo or co-written, was given the “Lennon-McCartney” label, though strangely, on the Beatles’ first album, “Please Please Me”, the songs were credited as “McCartney-Lennon”. But this was to be the exception to the rule, as John’s slightly stronger personality made sure the “Lennon-McCartney” handle stuck forever after. Even when Paul composed a motion picture score completely alone for a 1966 film called “The Family Way”, he still made sure his partner John Lennon received half of all royalties. With over 200 “Lennon-McCartney” songs composed over the next decade, John and Paul were to become the most beloved and successful songwriting team in the history of popular music, all thanks to a friend of Paul’s encouraging him to go check out The Quarrymen on that fateful Saturday- July 6, 1957.